“Sport tells a lot about who we are, where we’re from and has a large impact on society, our past, our identity and our character. It’s hugely important to remember our past and where we’ve come from. Not only do the events help shape people, communities, towns, society and culture of the past, it helps form where we’re going. Paine Proffitt is an American artist, living and working in Stoke-on Trent. He is best known for his sporting works and for his depiction of the “working man’s life”. Paine studied Illustration at Rhode Island School of Design and at The University of Brighton in UK and has exhibited in New York, Boston and Chicago. The Sport of football has been a major inspiration to Proffitt’s artwork. 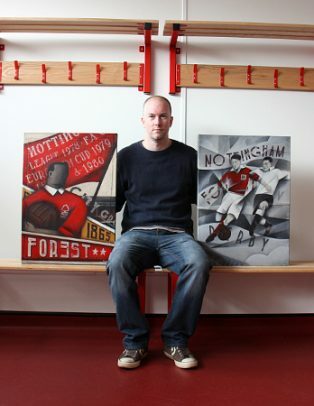 Since 2011, Paine has been commissioned to produce original artwork to feature on special programme covers for West Bromwich Albion FC, Aberdeen FC, Sunderland AFC, Derby County FC, Nottingham Forest FC, Aston Villa FC, Port Vale FC, Brentford, Italy and Grimsby Town FC, reaching an audience in the hundreds of thousands. Paine has also produced paintings for The International Rugby Board, The Scottish FA, Richmond Cricket Club and the famous Arsenal fanzine ‘The Gooner’. Selected artwork can be seen on his clothing range retailing at some of Europe’s top football club retail outlets. Paine also has a love of Ice Hockey and Baseball, and in 2015 one of his Baseball original pieces was selected into the prestigious USA Baseball Hall of Fame which includes a piece by artist Andy Warhol.